It's that awkward time when it's still cold out, but you long for warmer days and don't know whether to continue to buy clothes that will keep you warm, or buy clothes for those warmer days ahead. It's kind of tricky which is why my wish list is a tad bit of a hodge podge mix. I'm dying for Spring to get here (which is why most of the items above evoke warm weather with the pops of color & raffia), but at the same time I'd like to stay warm yet look chic. I think these are pieces you can get now and wear, and easily transition them into your Spring wardrobe. 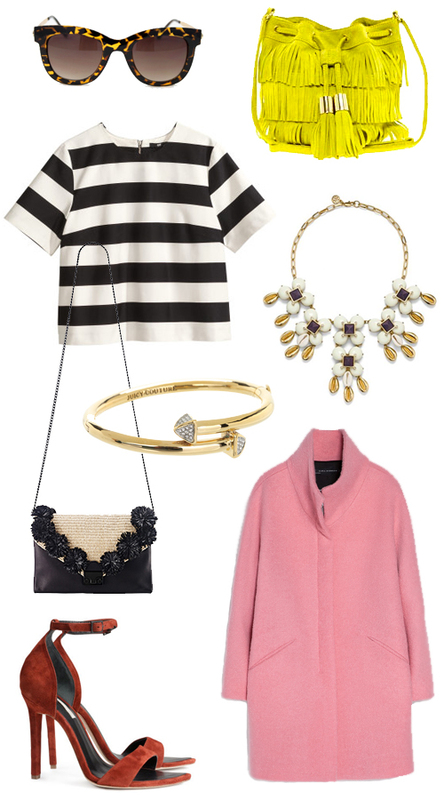 No doubt Spring has it's cool temp days, so that pink bouclé coat will be perfect for keeping you warm yet looking fresh. And I won't lie, that Raffia Lock Clutch would be the clutch to have on a beach vacation right now. I love me a good pair of tortoise sunglasses and at $24 (yes you heard right), this was such a no-brainer for me to pick up. And if there ever was a necklace to brighten up any outfit during this Winter-to-Spring time, it would be that Luca Statement Necklace, right? Any favorites of yours here? Or any specific pieces you're buying now in the hopes of wearing them in Spring? I love the pink coat! yes yes to those heels. i can think of 10 outfits off the top of my mind that i need them for.